Phinney Neighborhood Association Community Solar | CE - Clean Energy. Bright Futures. Seattle City Light customers liked the Community Solar project at the Seattle Aquarium so much that all of the units sold out in 6 weeks. 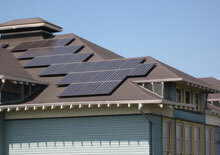 To learm more about Seattle City Light's Community Solar projects, click here. This project was made possible by an alliance between Seattle City Light, the Woodland Park Zoo and the Phinney Neighborhood Association. You can go directly to the online enrollment form or visit the Phinney Ridge Project and Community Solar FAQ pages for all the details. Energy monitoring provided by the Solar 4R Schools program made the live performance data from their PV system available for educational purposes.